Preheat the oven to 135C. Remove the ribs from the kale and cut into 4cm pieces. Lay on a baking sheet and toss with the olive oil and salt. Bake until crisp, turning the leaves halfway through, about 20 minutes. Serve as finger food. Steam rice with chicken broth. In a frypan, heat 1 tsp of sesame oil over medium-high heat. Cook prawns for 3 minutes (turning once) or until just opaque. Transfer to a plate. Add remaining sesame oil to same frypan over medium heat. Stir-fry onion, garlic, shallots and carrots until they start to soften, about 2 minutes. Add kale and cook for another 2 minutes. Pour in stock and cook, stirring occasionally, until kale wilts, about 3 minutes. Stir in prawns and hoisin sauce. Cook for 1 minute (stirring) or until hot. Serve over rice. Long reds from Kemps Creek. So what to do with these hot wonders? Just make sure if taking out the seeds, the hottest part, use gloves or they burn your fingers. If the seeds are gone the kids can eat them. 1 cucumber, sliced Can also use capsicum, carrots finely sliced, small corn. Precook rice in rice cooker but not completely or boil until just soft so add less water. In a wok heat oil then add garlic and chilli, followed by onion and stir. Add meat (not tofu). Cook around 3 minutes. Take out and put aside. Put in more oil add eggs spreading over wok. Cook and put aside. Put in other ingredients (tofu) with oil and stir gently for 3 minutes then add sauces. Followed by rice. Stir. Then last add meat. Stir soflty. Serve with lime slice. The trick is don’t overcook the rice or meat. The heart of this cabbage is crisp whilst the outside leaves are a crinkled dark green. It has a mild sweet flavour and the outside leaves are tender enough for making wraps, finely slicing into stir fry. It’s high in Vitamin C and A so all good too. What you didn’t know about Savoy. It takes up to 88 days to form the head. Doesn’t smell when you cook it. Harvesting cut at the lowest point leaving the outer leaves attached to the stalk. It sprouts again! The next cabbage will grow on the stem after the cabbage head is removed. Cabbages breath slowly – so storaged well they can last weeks. In the refrigerator in a container. If tupperware one vent open one closed or with a lid container pop open one end to let air in in. This is a quick and easy soup to do. In a soup pot heat four tablespoons of oil and sweat the onions adding the garlic and salad sprinkle, and cook for two minutes. Set aside 5 leaves. Then shred the rest add to pot with potato and stir three minutes. Add enough stock just to cover the vegetables, add the Parmesan skin, reduce the heat and simmer for 10 minutes, or until the potato is tender. Season with salt and pepper. If you wish an intense flavour put in some white vinegar about a tablespoon. Remove from the heat, allow to cool. Use a hand blender and blend the soup. Taste and season. Boy even quicker to do. through the cabbage before serving. Slaw with a twist. 2 days in fridge. See Meaning of *Non-Hydrogenated below. Coconut oil is enjoying a resurgence – it was a popular oil in Australia prior to the Second World War, when supply of it became limited. The oil is extracted from the flesh of mature coconuts and proves an extremely stable oil – it can be stored up to two years. Its very high smoking point meaning it won’t break down when you use it to cook curries and stir fries. It’s tasty and for the lactose intolerant who like their cakes, muffins and biscuits, its an easy substitute for butter. It can also replace butter and cream in pastry, and scones and in icings. Mixed in a frosting together with icing sugar and coconut milk it makes for a decadent topping on a dairy free cake. For flavourings use lemon zest, or orange zest, and cocoa powder. Coconut oil’s naturally sweet and its slight nuttiness adds to the depth of flavour in baking. As it does not break down at high temperatures it can be used to bake vegetables at 220 degrees celsius. A small amount (a tablespoon) is fabulous in a baking dish with a couple of medium potatoes, a sweet potato, 3-4 beetroot, chopped pumpkin and tofu – rendering them crispy skinned and seriously yum. Simply do a Stirfry vegetables with Tofu using the coconut oil as your start point. Use Organic Non-hydrongenated coconut oil. Add a tablespoon of Spice Peddler’s Tuscan, Jamacian Jerk, or Samba Seasoning to the oil and vegetables beforehand for a flavour hit. Coconut is also excellent oil in which to fry up your Thai or Indian curry base or to use in a Thai, Vietnamese or Chinese stir fry. Some of these are examined by former Principal Research Scientist at CSIRO Mike Foale in his fascinating Ockham’s Razor discussion with Robyn Williams on Radio National. Pilot studies are being undertaken to look into the benefits of coconut oil on early onset Alzheimer’s disease. The oil has antimicrobial properties and operates as an antifungal, antibacterial, antiviral and anti-yeast agent and can be used in small quantities as a leave in hair conditioner and de-frizzer, make up remover and skin moisturiser. It’s important to note that some of these health benefits are scientifically unproven at this stage and all of them relate to 100% pure virgin coconut oil, not partially hydrogenated coconut oil, which contains unhealthy trans-fats. Like all oils, coconut oil’s a fat and should be eaten in moderation. (A tablespoon contains at least 8 calories.) So although coconut oil is high in saturated fats, these are the medium-chain saturated fatty acids (MCFAs), which are now thought to be beneficial, as opposed to trans-saturated fats, which carry risks of heart disease and high cholesterol. It also changes it’s appearance in warm Sydney weather transforming from a cold weather solid to a warm weather liquid. * Hydrogenation is the process of adding hydrogen to a fat. This stabilizes it and gives it a longer shelf life but adds nasty trans fat. So this coconut oil at Harvest Hub does not have the Hydrogenation. Harvest Hub aims to bring family and friends to the dinner table in conversation. A good way to this is eating fresh produce, cooking together, opening discussion on eating healthy, seasonal and fresh. Metella Road Public School is located in Toongabbie, Sydney, about 15 minutes from Parramatta. It is a school that hums and the Principal, Peter D’Emilio, has a smile on his face and spring in his step. The reason being is that he has an amazing community both inside and outside the school who support each other with the various initiatives. When you enter the Metella Road Public School the staff, the teachers and the children in the playground have wide smiles and the general hum of happy voices wraps around you. This school has something different. They had a Spring Fete a few weeks ago and it was a joy to see how many families and community members came to support the fundraiser. But it was the glowing chatter from parents about how the school is making a difference for the children. Colleen and Edwina – Where are those potatoes? Making a difference teaching practical life skills and now a Harvest Hub which will provide the opportunity to have Local Sydney Basin produce and for families to cook together. In the Blacktown Sun Peter mentions that the Hub will support the Crunch & Sip program where the children have a break to eat fresh fruit & veg. The Harvest Hub program will enable those children coming to school without fruit or veg an opportunity to have a piece. Colleen and Edwina had fun divvying up the bags and look forward to volunteers helping every week. The school receive $4 for every bag they pack and on their very first week they packed 18 bags. A great fundraiser which will assist in providing funds for school projects. David in the Before/After school care has also taken the opportunity to provide for their group by ordering through the Hub. This way they don;t have to trudge off to the shops and are saving by purchasing this way. This coming week in your fruit and veg bag our local Growers, Steve and Sam Grima, from Horsley Park are over the Rainbow with Colourful Swiss Chard – different shades of red, orange, pink and yellow. Packed with flavanoids, a powerful antioxidant that can help prevent cancer. Packed with flavanoids, a powerful antioxidant that can help prevent cancer. The flavanoids attack ‘free radicals‘ associated with the creation of rogue cells that can lead to cancer. 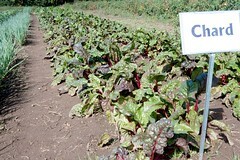 To Store: Do not to wash your chard until you are about to use it, so keep it in an airtight bag, up to 5 days. Freeze if not using soon – Blanch by popping into hot water for 2 minutes, then icebath, dry off then into a bag and freeze. Aside from the health benefits, this farm fresh veg looks very colourful on the dinner plate. You can cook it like green silverbeet: steam, stir-fry, or cook in a pie or frittata. A Stir fry seals in delicious flavours quickly, takes very little time to cook and best of all you can prepare vegetables and meat the night before. Often we cook in the sauce. Here is a way to get great meat and veg without boiling it in the sauce. First use a large work.The key to stir fry is to fry not to boil, braise or steam. How many times have you had the veg and meat boiling in a sauce in the frypan or wok? Preparing your wok or frypan is important. Make sure it has been seasoned (wipe oil over it and leave on a high heat. This leaves a lining on the pan). Leave this lining on the pan and not scrub it off. Then most importantly, always super heat the pan before you cook otherwise you end up braising the food – this is not stir fry. 6. Noodles or rice precook and heat up. Meat – to get a Crispy Meat Cover – coat it in baking soda and let sit 30 minutes in fridge. Wash off soda and roll in cornstarch. Then stir fry, add vegetables and add sauce last. Otherwise you can marinate the meat beforehand. If you ever need to tenderize meat (using a cheaper cut) then pop it in a bowl with fresh pineapple juice no more than 2 hours (check after 1 hour) or the meat will turn to mush. The natural enzyme, bromelin, will break down the protein. The other thing to consider is: cook hard vegetables first then soft ones. Cook in batches and not to do all at once. Cook meat on its own and set aside. Then the absolute secret? The sauces. Use a large nonstick pan with sloped edges of a cast-iron frypan. The heavier the pan the more even the cooking. But make the pan a large one as surface area is important to move the vegetables around. The aim is not to overcook and to cook in batches and then put it together at the end. Use different oils – olive, peanut, sesame when cooking vegetables, meat. Prepare vegetables: Cut vegetables into lengths and thin eg: carrots and celery. For visual dynamics cut some longwise into circles eg: zucchini. Use onion, garlic first and fry up in hot oil. Test oil ready with a drop of water which sizzles. Add vegetables first that take longest to cook carrots, broccoli then add soft ones – sugar snaps, celery and so on. Last add bok choi (Chinese vegetables) Hint: Did you know you can use lettuce. Try iceberg, cos.These are done with quick turns in the pan. Set aside. Prepare meat: by cutting into thin strips, not too long. If using chopsticks just enough to grab and fit into mouth. Excellent meats are rump and sirloin. Cook meat separately and quickly. Set aside. Steam rice or cook noodles. Bean sprouts add to mix last and stir through. Then either serve in bowls separately or combine all three. Use tongs to combine vegetables and meat into noodles. Use Oyster sauce or soya last and move it through the mix. If serving separately, use different sauces ie: Oyster, soya, blackbean, and sweet chilli. Can use a dollop of curry in onion/garlic, or chilli, or Thai flavour (palm sugar, vinegar, chilli, garlic, oil, coriander). Stir fry Sauce – 2 tbs soya sauce, 2 tbs rice wine or dry sherry, 1 tbs of cornflour. Simmer sauce until thickens then pour on vegetables. 10.Have rice or noodles ready then heat up.